For third generation Pitmaster Kent Black, serving his famed brisket and sausage at the Lyndon Baines Johnson National Historical Park next spring to benefit the LBJ Museum of San Marcos will be a true homecoming. 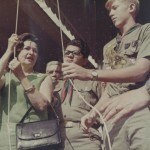 EAGLE SCOUT Kent Black, right, joins Lady Bird Johnson, left, at the dedication of a Lockhart highway beautification project in 1967. Kent Black’s BBQ of San Marcos, Lockhart and Austin (www.blacksbbq.com) will be the featured caterer and a sponsor for Spring Shindig 2016: An LBJ Party at the Texas White House, the first major fundraiser for the Claudia Taylor (Lady Bird) Johnson Endowment for the LBJ Museum. The event will be April 23, 2016 in the Oak Grove at the LBJ Ranch in the park. The Black family has served their delicious barbecue for President Lyndon Johnson’s family for decades—going back to the former president’s early days as a Congressman, as U.S. Senator, as Vice President and as President of the United States. Kent’s grandfather, former Caldwell County Judge Edgar Black Sr., founded the business in 1932. Kent’s parents, Edgar Black Jr. and Norma Black, now retired, later ran operations until their son took over in 2008. Black’s BBQ arose out of necessity during the depths of the Great Depression. Edgar Black, Sr. did not want to do that. He had a friend, Joe Roble, who wanted to open a meat market. “My Grandfather had cattle; his friend had a meat market — and that’s how Black’s BBQ started,” Black said. LBJ was elected to Congress in 1937 and the Black family recalls his campaign visits to Lockhart over the years. 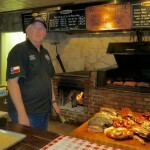 PITMASTER KENT BLACK and his renowned barbecue. An honors graduate of Texas A&M University after World War II, Edgar Black, Jr. had the chance for a job in Houston with Exxon, Kent said. However, Edgar Sr. persuaded him to take a two-week break at home—a break that lasted the next 65 years. When he was a child, Kent’s family served on the committee to support the Kennedy-Johnson ticket. The Blacks went to a birthday celebration at the rodeo arena in Stonewall where they had a big L-B-J shaped birthday cake. During Johnson’s presidency, Lady Bird Johnson came to Lockhart to promote the Highway Beautification program, one of the great legacies of her years as First Lady. Black also reminisces about helping prepare brisket and sausage to ship to the White House during LBJ’s presidency—under the watchful eyes of the Secret Service. After LBJ’s death in 1973, Mrs. Johnson made many trips to Lockhart, the Barbecue Capital of Texas, to enjoy the spring wildflowers, to visit her college roommate, and to dine at Black’s BBQ. Kent Black’s “other” career is that of an attorney. He earned a law degree from the South Texas College of Law in Houston. He has been in private practice and served as an administrative law prosecutor with the Department of Human Services for 20 years, general counsel for the Board of Nurse Examiners and as a municipal judge in Lockhart. Kent Black’s BBQ is gaining national recognition. “Once you get more than 30 miles from Lockhart, you can’t find this type of barbecue,” Black said. It’s in demand across the nation and business during the holiday season is brisk. On Dec. 3, Black spent 15 hours doing interviews and demonstrations with “Burgers, Brew and ‘Cue” on the Food Network, a program that will air in early spring. The host is Michael Symon, winner of Iron Chef and a regular on “The Chew,” on ABC. The Spring Shindig will show case exciting performances by iconic singer Michael Martin Murphey, with opening performances by Ryan Scott Travis, Jan Seides, and other special guest stars from the Texas entertainment scene. Luci Johnson and Lynda Johnson Robb are honorary chairs of the event, which will also feature a Texas Hill Country beer and wine tasting and live auction of unique items. Individual tickets are available for $90 each and must be purchased in advance. For a ticket or to be a sponsor, visit www.lbjmuseum.com/springshindig or contact event organizer Suzanne Perkins at 830-385-1645 or suzanne@lbjmuseum.com. Sponsorship levels include Presidential ($10,000), Vice Presidential ($7,500), Senatorial ($5,000), Congressional ($2,500) and Wildflower ($1,000).